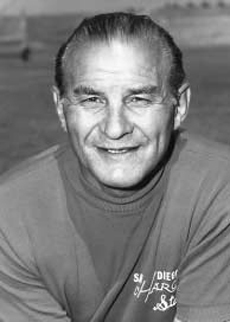 One of football’s great innovators, Sid Gillman served as head coach of the National Football League’s (NFL) Los Angeles Rams from 1955 to 1959 and the American Football League AFL/ NFL Los Angeles/San Diego Chargers from 1960 to 1971. Before he made his name as a professional coach, Gillman, an All-America end for Ohio State University in 1932 and 1933, served as either coach or head coach for 21 years in college football at Ohio State, Dennison, Ohio; Miami of Ohio; West Point Military Academy; and Cincinnati. His collegiate teams won 79, lost 18, and tied 2. As head coach of the NFL’s Rams, Gillman won one Division title. With the AFL Chargers, he captured five Division crowns and the 1963 AFL Championship. Gillman was the first head coach to win Divisional titles in both the NFL and AFL. Poor health forced his premature retirement in 1971. Phillips, Dan Henning, Ara Parseghian, and Paul Dietzel. Many credit the success of the “upstart” AFL to Gillman’s skillful organizational techniques. With improved health, Sid joined the Houston Oilers in 1973 as their general manager. Halfway through the season, he fired the head coach, took over the job, and led the Oilers on and off the field through 1974—after which he was fired. Nevertheless, he was named NFL Coach of the Year in 1974. 14 seasons. Sid moved to the Philadelphia Eagles in 1979, but following heart by-pass surgery, his duties were narrowed to quarterback development. Sid Gillman was elected to the Pro Football Hall of Fame in 1983 and to the College Football Hall of Fame in 1989.